Place the Squash Cubes in a baking pan. Cover the Squash with aluminum foil and bake in a 350 degree oven for 1 hour or until the Squash is fork tender. While the Squash is baking prepare the Pasta Dough. Combine the Flour with the Tomato Powder, Salt and Nutmeg and then follow the directions on the page for Basic Pasta Dough. When the Squash has finished baking, remove from the oven and allow to cool. Roll out one portion of dough at a time to the desired thickness; if using a ravioli form, be sure to roll out the dough so that it will overlap all the sides of the form. With a rolling pin, start rolling, lightly at first, from the center of the plate to the ends until the surface is flattened. 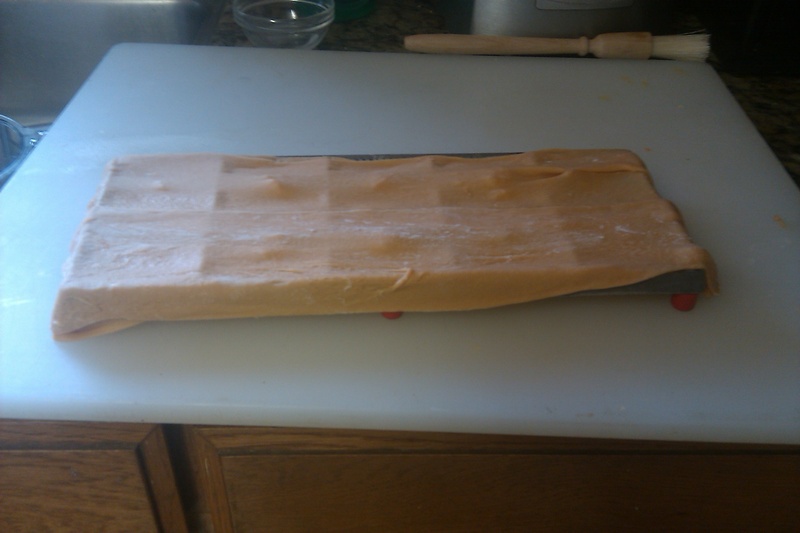 Next roll firmly in both directions, length and width, until Ravioli are cut and sealed. If using an individual Ravioli Cutter, roll out one sheet of dough and with a teaspoon or food scoop, place the filling in even portions on the sheet of dough, leaving enough room around each mound for cutting and sealing. Place a second sheet of rolled dough over the first one and with an individual Ravioli Cutter, cut out the Ravioli wherever there is a mound of filling. Save the scraps to re‑roll, for additional Ravioli. Bring a large pot of Water to a rapid boil; add a Tbsp, Salt and the Ravioli. (Do not cook too many Ravioli at one time ‑ there should be plenty room between each one to allow for rapid cooking). Cook for about 4 minutes or until al dente. While you are waiting for the Ravioli water to boil, heat a sauce pan over medium high heat. Add the Squash Seed or Olive Oil and half the Butter. Add the Sage Leages, lower the heat and cook until the Butter starts to Brown. Add the remaining Butter and cook until the Sauce is the desired color.